Bowes Castle was originally an 11th century earth and timber ringwork and bailey fortress, founded by Alan, count of Brittany. Built to guard the strategic Stainmore pass over the Pennines, it stands in the north west angle of the 3rd to 4th century Roman fort of Lavatrae. In the late 12th century, King Henry II founded the stone keep and bailey castle, when adding a massive rectangular three storey hall-keep and forebuilding. Divided into two baileys by a wide once wet moat, the layout of the outer bailey, is shown by the remains of its Roman ditch. No other masonry work is apparent but the church of St Giles once stood within the original inner bailey. Reported as being in ruins and of little use in 1325, it is thought to have been dismantled and stripped of much of its stone facing by the 17th century. 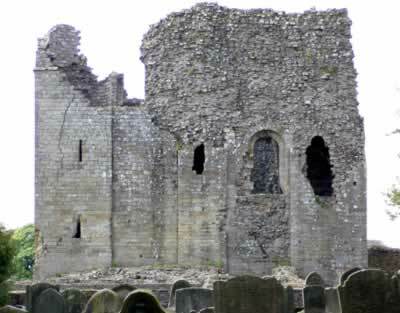 5 miles north-east is Barnard Castle and 14 miles west is Brough Castle. Bowes Castle is located in the village centre, off The Street. 29 miles south-west of Durham, on the A167-A688.